Explore downtown Las Vegas during a 1.5-hour tour by trikke, a 3-wheeled electric scooter. Cover a lot of ground as you zip around town with your experienced guide, discovering the architectural landmarks, restaurants, entertainment venues, and public art of the City of Lights. 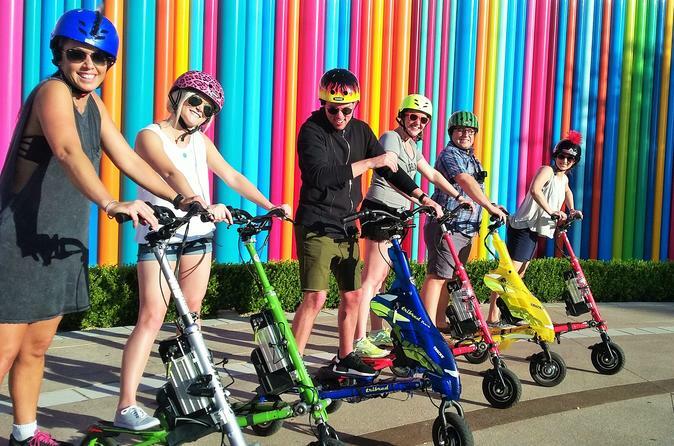 Make your own way to downtown Las Vegas to meet your guide for your trikke tour. Start with a short lesson from your guide on operating the trikke; most people get the hang of it within a few minutes. Once you are comfortable, set off with your guide to discover downtown Las Vegas. Zip over to architectural landmarks including The Smith Center for the Performing Arts, the Las Vegas Design Center or the World Market Center, and the Lou Ruvo Center for Brain Health, which was designed by superstar architect Frank Gehry. You can also ride past the historic 5th Street School, the neo-classical Las Vegas Post Office and Courthouse, and the new city hall, which was designed with environmentally sustainable features. In recent years, the downtown has been transformed by an infusion of new buildings, public art, and cafes, bars and restaurants that are popular with both locals and visitors. See colorful murals that were installed by the Life Is Beautiful festival, an annual arts festival held in Las Vegas, and hear about trendy hotspots away from the Vegas Strip. Choose from a morning or sunset tour that includes use of all necessary equipment such as a helmet and headset to hear the guide, bottled water, and cargo nets for storing personal items. Your tour ends after 1.5 hours with return to your starting point.